Request a complimentary copy of Imagine magazine! 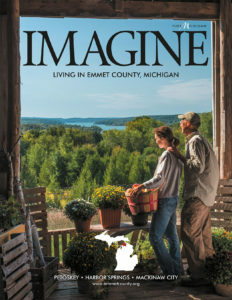 Each year, Emmet County is proud to publish a high-quality magazine that features the stories of the people who invest in Emmet County, from entrepreneurs to philanthropists, families to retirees. This magazine is the premier piece that tells the story of Emmet County, and what makes it such a special place to live, work and play. We’d love to send you a copy! Request yours by emailing info@emmetcounty.org or by calling (231) 348-1702.